12.5" RCOS @ ~f/9 (2880 mm fl) 0.643 arcsec / pixel. The Zoomify image scale is 1.28 to 3.11 arcsec / pixel. 03/01/2009 to 12/26/2009 Chino Valley, AZ... with CCDAutoPilot3 & CCDSoft. Ha:OIII:OIII mapped to R, G & B respectively with an RGB overlay for star colors. Click here for the narrow band color mapped version. eXcalibrator for (u-g) color calibration, using 15 stars from the SDSS database. CCDStack to calibrate, register, normalize, data reject, combine the sub exposures & RGB star color combine. PhotoShop for Ha:OII:OII color combine & on-linear stretching. Although taken with narrowband filters, the image is a pretty good representation of RGB colors. Using narrowband filters greatly enhances the detail. 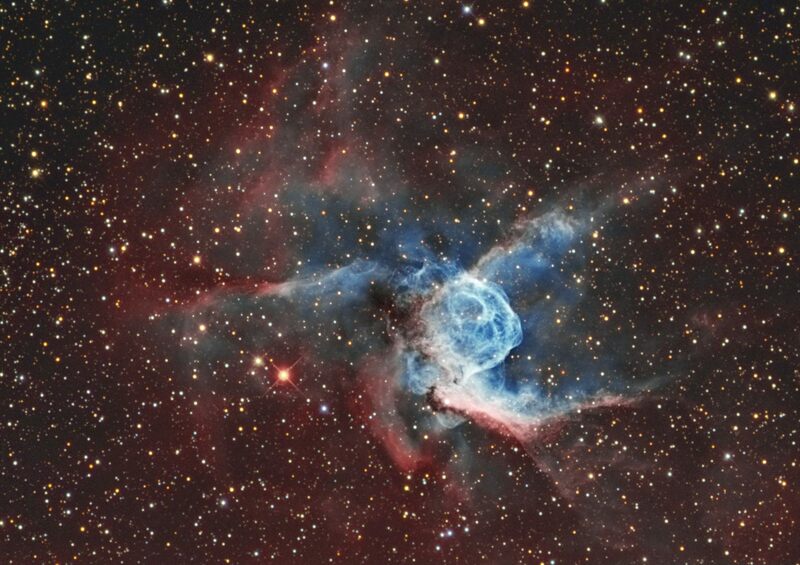 Thor's Helmet is about 30 light-years across. The helmet is actually more like an interstellar bubble, blown as a fast wind from the bright, massive star near the bubble's center sweeps through a surrounding molecular cloud. Known as a Wolf-Rayet star, the central star is an extremely hot giant thought to be in a brief, pre-supernova stage of evolution. The nebula is located about 15,000 light-years away in the constellation Canis Major.